SWF member CE badges, give-aways & other "swag" items! 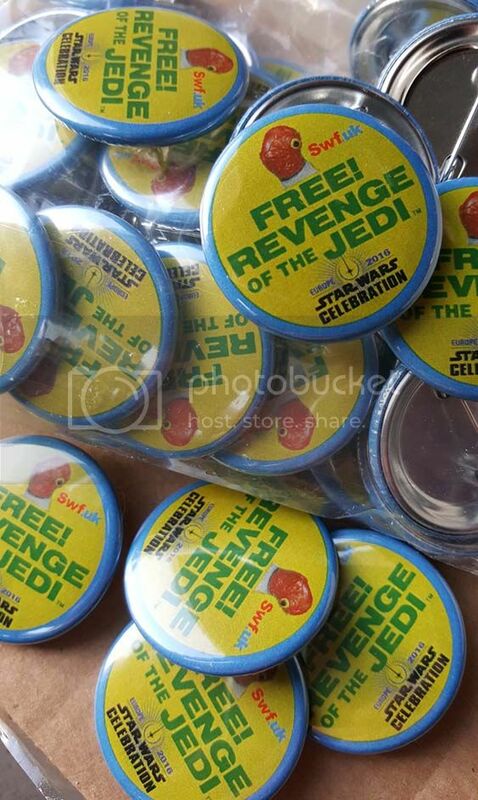 Re: SWF member CE badges, give-aways & other "swag" items! Last edited by robpmarsh on Wed Jul 13, 2016 12:32 pm, edited 1 time in total. Very cool indeed, Rob. And Peter those bags are very nice indeed. German Kenner Logo with German Flag behind and a very limited Edition of 10 each day with UK Flag behind. Thanks a lot to Marcus for the help. Chris (aka chris.75) just finished up the (10) Rebel Fleet Troopers, along with the R4-M9 droids, that everyone has chance to win. Got my badges. Hope you like them. More attempts at watercolour. 2 of my favourite Imperials. Wow. Some talented members on these boards and what a great thing to do for each other! Wish I'd signed up earlier lol. Have a great time all. I might end up sending you a PM at the weekend to find out where you are because I'm desperate to get my hands on one of these set! Woohoo! Best Badges came through for me. I'll have 50 of these available on Saturday. Everybody's favourite Revenge/Ackbar offer. Well, mine at least. Who had the Dairylea badges? I hunted high and low for that one! Did u manage to find me? Met loads of people and partially hungover each day from previous evenings in The Fox!